Since 1988, the Fundació Crèdit Andorrà has granted 192 scholarships to young people looking to study a postgraduate degree abroad (master, doctorate and post-doctorate). 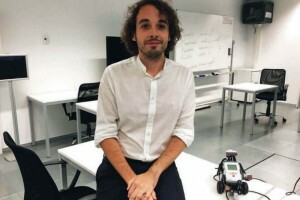 One of last year’s recipients was Paulo Ricardo Gomes da Costa, a psychologist with a Master in Infant and Adolescent Psychiatry and Clinical Psychology from the Universitat de Barcelona. Paulo was awarded a scholarship to study the EADA International MBA. You have already started to apply the knowledge you acquired on the MBA. Yes. A month ago, I started working for Specialisterne in Sant Cugat del Vallès, an IT company that provides job placement for people with autism spectrum disorder and/or Asperger syndrome. And how does Specialisterne do this? Through IT documentation, software and programming services companies, services that are carried out by consultants with autism spectrum disorder and Asperger. What’s more, the company trains the people itself so that they can carry out the tasks. Is it true that people with autism spectrum disorder are whiz kids in information technology and numbers? Some of them, but not all, have a special skill for repetitive tasks and demonstrate an interest in specific subjects such as IT, but it’s very difficult to generalise. There is no global pattern. What they all share is strong concentration skills. As they have social difficulties, sometimes in a job it’s easier for them to concentrate on information technology than to have to talk with their colleagues. The company where I work matches one thing with the other. By offering a job opportunity, you give them the option of becoming an autonomous –and, depending on the individual, completely independent– person. Do you think this would be viable in your home country of Andorra? We are carrying out a viability study but there aren’t enough adults diagnosed with Asperger to warrant starting up a company, although we could set up some kind of collaboration. Because before taking the MBA I had worked for an association of people with autism spectrum and Asperger. I worked there for eight years doing psychological therapy, working with groups of parents, on social skills, etc. I realised that they needed something more at an occupational level because these people have very good competencies but society does not take advantage of them. I would like to use the MBA to launch a company project to insert people with disabilities in the labour market. My goal was to bring psychology and business together. And you were voted best student in your MBA class? I really didn’t expect that! I studied with engineers and business owners, and I come from another world. I did my absolute best during the programme. Originally published in El Periodic d’Andorra, «La societat desaprofita persones amb autisme», 05/10/2016 pág. 24.